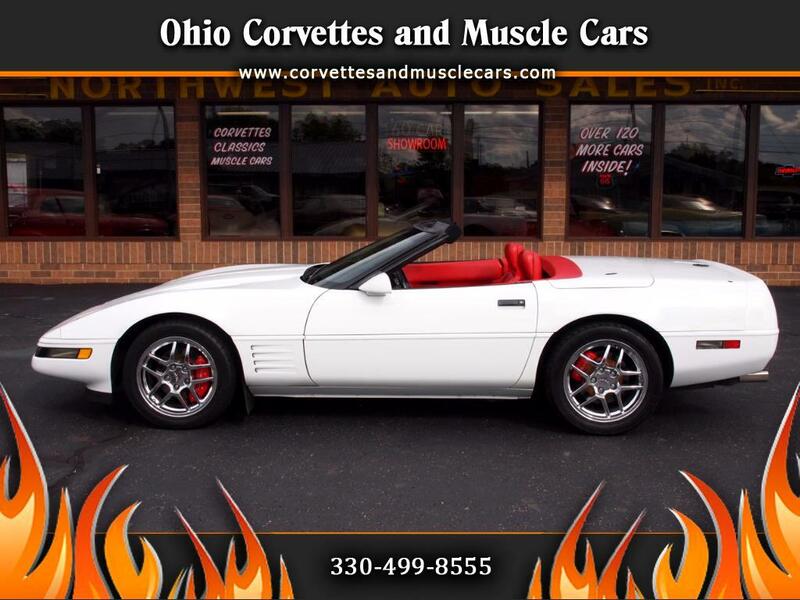 Here is an extra clean 1993 Corvette convertible. Finished in its original color of Arctic White, this car is is one of only about 5,000 '93 Corvettes that were equipped with the 6 speed manual transmission (out of about 21,000 corvettes produced). It is a very well maintained original car that we sold about 15 years ago and are now offering again. The pictures are very representative of the actual condition of the car...the original paint is in extremely good condition, as is the original red leather interior, with only slight signs of age on the driver's side bolster. It has been upgraded with the red brake calipers, and chrome wheels, which gives the car a real classy look, and accents the red leather interior very nicely. All electronics work properly, as do the headlights and power windows. The top has three minor cracks from spending most of its life in the down position. If you are looking for a gently used C4 with a manual transmission, you should look very closely at this one.